The current situation in Punjab, where addicts were resorting to the use of concoctions due to scarcity and high price of drugs, had warranted such harsh steps, Singh says. 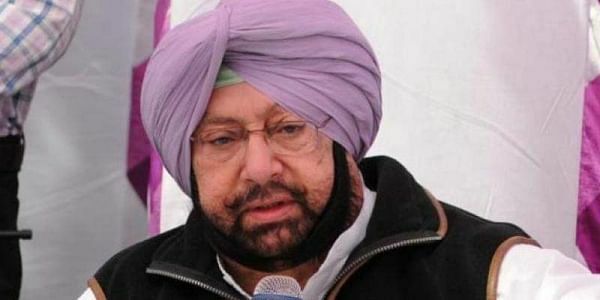 CHANDIGARH: Punjab Chief Minister Capt Amarinder Singh on Monday defended his decision on dope test for government employees and police personnel, saying such tests were also conducted in the Army, as a precautionary measure. The current situation in the state, where addicts were resorting to the use of concoctions due to scarcity and high price of drugs, had warranted such harsh steps, he said. The CM was attending the passing out parade at the Police Recruit Training Centre at Jahan Khelan near Hoshiarpur. The pressure mounted on the drug smugglers and mafia had choked the supply lines, forcing addicts to go for concoctions, which were resulting in instantaneous deaths, Amarinder pointed out. He reiterated that as far as dope test for politicians and elected representatives was concerned, he would leave the decision to their conscience. The proposal for death sentence in the first instance of offence was also aimed at the elimination of the drug menace, Amarinder said in response to questions. The increase in tip-offs received by the police and the large number of youth coming to drug treatment and rehabilitation centres showed that the people were also worried about the deaths being caused by the use of concoctions by the youth and were actively joining the government's campaign against drugs, he added. Asked about the case against former Moga SSP Raj Jit Singh, Amarinder said the Punjab and Haryana High Court had already constituted an SIT to probe the matter and the report had been submitted to the court. With Raj Jit submitting his passport to the court, there was no danger of his fleeing the country, he said, while replying to another question. To a question on the allegations against former Akali minister Bikram Singh Majithia, he said the SIT had submitted its report to the court and the matter was before it. Reiterating his demand for in toto implementation of the MS Swaminathan Report, Amarinder said the hike on MSP announced by the Centre was nothing but a political gimmick. Amarinder in response to a question on the problem of gangsters in the state, made it clear that law and order would be maintained by his government at all costs. Many of the gangsters had already been eliminated while the rest had been warned to give up or face the consequences of their actions. Amarinder launched the 'one rank up promotion' scheme for assured career progression of police personnel, thus bringing to an end the stagnation in the force with the assertion that nobody will retire from Punjab Police before becoming an ASI. Addressing recruit constables at the Police Recruit Training Centre he expressed concern over the disillusionment in the force due to high stagnation in the rank of Head Constable and Non Gazetted Officer (NGO), as several police officials are not promoted despite being eligible due to the availability of fewer vacancies in the rank. Formally launching the Assured Career Progression (ACP) scheme, he piped stars on the uniform of 14 newly promoted police officers. The scheme provides for promotion of Head Constable to Assistant Sub Inspector (ASI), Assistant Sub Inspector (ASI) to Sub Inspector (SI) and Sub Inspector (SI) to Inspector, after having been successfully completed service of 16, 24 and 30 years respectively. Likening the training imparted to the recruits at PRTC with the prestigious Indian Military Academy and National Defence Academy, he also announced Rs. 5 crore from the state budget for further upgradation of the existing infrastructure and Rs 50 lakh from his discretionary grant for welfare of the police force and their families. He earlier took the salute at an impressive march past during the passing out parade of 255th batch (district cadre) on their completion of ninth month basic recruits training course here at PRTC.